You hear a lot about flashes and floaters when discussing vision. We all experience the occasional floater or flash, but sometimes these can be signs of a major problem with your vision and general health. and how to get the treatment you need when it's needed most. Floaters refer to little spots and flecks that appear in your vision. They tend to look clumpy and strange. Many liken them to cobwebs or dust bunnies that appear in your vision. A lot of people notice minor floaters in their vision, which is normal to a certain degree. Floaters become a major concern when they come on very suddenly and are pronounced. Floaters are the result of the composition of the vitreous gel in the eye. The interior portion of the vitreous gel is more liquid-like. The gel-like outer portion eventually collapses inward to the liquid portion, resulting in floaters. Typically the floaters are harmless and natural in small amounts. Flashes are just what they sound like: a sudden flash of light in your field of vision. You might see stars or jagged lines or perhaps even distortions in your vision that appear to be heatwaves. Usually a sudden flash in your vision is the sign of something wrong. The flashes of light you see are the result of the retina becoming physically stimulated, often by the vitreous gel tugging or touching the retina. Flashes tend to be brief and temporary for minor mechanical stimulation. Flashes may be long-lasting and severe for major issues with retinal health. What Eye Conditions Cause Floaters and Flashes? 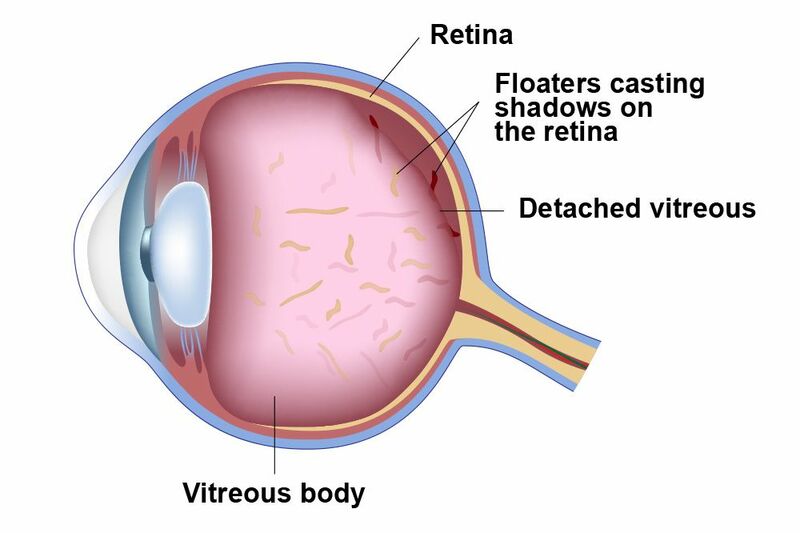 Retinal Detachment – Retina detachment refers to the peels away of the retina from the back of the eye. This can lead to permanent vision loss if the problem is not addressed as soon as possible. Retinal Tears – Retinal tears occur when the retina peel off the back of the eye but does not completely detach. These can be serious matters, and can increase the risk of retinal detachment. Myopia (Nearsightedness) – The shape of a nearsighted person's eyes can lead to stimulation of the retina from the vitreous gel. Eye Infections – Serious inflammation of the eyes can lead to the vitreous liquefying and causing many floaters in the process. Diabetes – Long-term diabetes can lead to a condition known as diabetic retinopathy, which affects the blood vessels of the retina and can contribute to serious vision problems as a result. Cataract Surgery – A harmless side effect of cataract surgery, it's possible for harmless floaters to form even months after the procedure. When Should I See a Doctor About These Issues? If you notice the very sudden onset of flashes and floaters in your vision, be sure to seek immediate medical attention. Acting quickly can save your vision and prevent varying degrees of vision loss. For more information about flashes, floaters, and other vision concerns, be sure to contact our team of advanced eye care specialists today. Our retinal health experts will help you have exceptional vision.